Haiti’s official seismologist, who predicted the recent earthquake, has warned that an even stronger one is likely to hit Port-au-Prince within the next 20 years. Now the Haitian government is debating how and if the capital should be rebuilt — or if it should be moved elsewhere. He had predicted an earthquake with a magnitude of about 7.2 points on the Richter scale, and the actual quake measured 7.0. For years, he had taken precise measurements and performed careful calculations, and he had done his job exceedingly well. When the earthquake struck, he was sitting at home in front of his computer. He jumped up and took shelter in the doorframe, because good doorframes are more capable of standing up to an earthquake than walls, something that Prépetit knows well. In fact, as the Haitian government’s official seismologist, he knows everything about earthquakes. In those 40 seconds, his brother-in-law and some of his friends died. Shortly afterwards, his father-in-law also died. Prépetit survived. After having spent years warning about the possibility of an earthquake striking Haiti, he can hardly be blamed for what happened there. Prépetit, a tall man with a wrinkled face who is wearing sneakers, now says, quite calmly, that the earth beneath Port-au-Prince will shake again, but first it will happen farther to the north. The next quake, according to Prépetit’s calculations, will be even stronger, probably measuring about 7.6 on the Richter scale. He predicts that it could happen in 20 years’ time, give or take a few years. The Haitian capital may be tomorrow’s deathtrap, but it is currently today’s nightmare. The bodies still lying in the wreckage are decomposing in the heat, while the survivors simply step over them. Looters are clearing out the ruined buildings, hunted by police officers on motorcycles wielding pump guns. The hungry survivors fight over every bag of rice tossed down from the trucks of international aid organizations. The United Nations estimates that 75 percent of the city will have to be rebuilt, and that well over 500,000 people are now living in the streets. The more fortunate of the newly homeless have plastic tarps, mattresses or wooden boards to build tents for themselves. The drone of American Blackhawk helicopters can be heard overhead. The Haitians have been promised $2 billion (€1.43 billion), both for the immediate disaster relief effort and to pay for the reconstruction of the country and its capital. Now the question is how to go about it. There are two possible approaches, one dangerous and the other audacious. The Haitians could rebuild the capital to look more or less the way it did before the quake, except with more stable official buildings, naturally. That would be enough — until the next major earthquake. 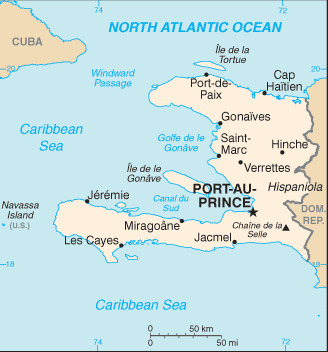 Or they could use Prépetit’s map, embark on a bold exodus from Port-au-Prince and build a new capital elsewhere. The latter approach would resemble what the Brazilians did in 1960, when the government moved to the newly built city of Brasilia, deep in the country’s interior. In 2001, Prépetit’s prediction that the fate of Port-au-Prince is to be destroyed again and again was confirmed when a group of French seismologists came to the island, bringing along state-of-the-art instruments. Prépetit helped them distribute 30 measuring stations around the country. Then the scientists waited, monitoring their instruments, and eventually the equipment began spitting out data. Using the data, the seismologists could calculate how much energy will be released when there is a sudden shift in the two tectonic plates that come together near the capital, the kind of shift that is likely to happen repeatedly. The only problem is that no one can predict when these shifts will take place. Should Prépetit have spoken up more loudly? And even if he had, could he have convinced the government to do anything? “Resettling hundreds of thousands of people is very expensive and very difficult. Haiti is a poor country. And besides, I didn’t know when it was going to happen. What if it hadn’t happened for another 30 years?” But now Prépetit wants to talk, and he wants people to listen to what he has to say. An earthquake already destroyed the city once before, in 1751, and the survivors rebuilt Port-au-Prince. The next major quake came in 1770. “We cannot invest a cent in Port-au-Prince; it would be a waste of money,” says Bernard Etheart. “We can’t afford to lose everything once again. We must take advantage of the opportunity we have today.” Sitting in a radio studio, Etheart takes off his headphones and runs his hand through his tousled white hair. He laughs a lot and, at 72, moves like a much younger man. Etheart studied in Munich, where he met a young female journalist, also from Haiti. The two returned home to Haiti, but before long then-Haitian dictator Jean-Claude Duvalier, known as Baby Doc, expelled them from the country, as part of an effort to do away with his critics. After 18 years in exile, they finally returned home. Etheart was a professor for many years, and he now runs the government’s institute for land reform. Agriculture is about the only industry that functions in Haiti, which produces sugarcane and coffee and not much else. Haitians have little choice but to listen to Etheart, whose wife owns one of the most influential radio stations on the island, which, of course, gives Etheart a forum for his views. About 50 percent of Haitians are illiterate, and many are too poor to afford a television set. But the one thing they can do is vote, which is why radio is such a powerful medium in the country. The Ethearts also publish a newspaper. Etheart believes that the earthquake must now force Haiti to finally stand on its own feet. Of the country’s population of 9 million, about 2 million live in the crowded Port-au-Prince valley, at a population density of 5,000 people per square kilometer. The capital is a population magnet, and yet it is incapable of feeding so many people. The conditions contribute to the growth of slums, like the ones that have crept up the hills surrounding Port-au-Prince. When the earthquake struck, the poorly constructed houses on these hillsides quickly slid downhill, burying the inhabitants in the process. Etheart has a plan that could solve the country’s problems. He opens a file and pulls out a piece of paper, a graph taken from a study conducted by a colleague. It illustrates Haiti’s vicious circle: The government invests its money in the capital, but this only aggravates the country’s poverty. As the capital becomes more attractive for migrants from the countryside, the state is forced to spend more money, becoming even poorer in the process. “It is now time to break through this vicious circle,” says Etheart. “We must invest in the country’s small cities.” But it would be unacceptable to forcibly displace people, he adds. “We have to offer them incentives” — jobs, schools, hospitals, anything with a future. Of course, the earthquake could also help Etheart press forward with his dream of major land reforms. The government is already sending thousands of people to rural areas. Initially buses and trucks left the chaos of the capital on a daily basis, transporting passengers to the countryside at no cost. The only catch was that no one was given return tickets. But now very few city residents are taking the government up on its not-too-subtle resettlement offer. This is not surprising, since the refugees have little to look forward to in the countryside: no jobs, no place to live and not much to eat. “What am I supposed to do in the countryside?” asks Cynthia Saint Fort. The 22-year-old nurse wants to go to medical school, and the country’s only university is in Port-au-Prince. Of course, she adds, she is also afraid to stay there, in a place where she has seen so many people die. She says that she is only alive today because someone else died. When the houses began breaking apart, she started running and tripped, and a man fell on top of her. As he was lying there, a piece of concrete fell on the man and killed him. For Saint Fort, Port-au-Prince is still the only place where she feels useful. The hillside house she and her brothers lived in before the quake was destroyed, but the family has now built a makeshift shelter in the ruins with mattresses, furniture and tarps. They plan to rebuild the house, and they hope to receive government assistance to do so, but like everyone else, they have no idea what the future will hold. She spends her days tending to her patients in a makeshift hospital set up in the courtyard of a house. Death was yesterday. Now her life is in Port-au-Prince. Etheart is familiar with all of the reasons why Haitians are unwilling to leave the capital. But he also believes that if all the money that is now being pledged to Haiti is invested in smaller cities, life outside Port-au-Prince could also become more appealing. A small research facility, the only building left of the country’s Ministry of Public Works, lies on the outskirts of downtown Port-au-Prince. Jacques Gabriel, Haiti’s minister of public works, transportation and communication, walks with a stoop as he enters his new office. It is empty, with the exception of a desk, five moving boxes, and a framed map of Haiti leaning against the wall. His ministry literally disappeared beneath his feet. When the earthquake struck three weeks ago, Gabriel tried to make it to the door, but it was jammed. A hole opened up in the wall, and when the ground shook he was thrown to the floor. Another tremor flung him outside, bruised but alive. He doesn’t see very well now, after losing his glasses in the quake. He hasn’t been able to find his optometrist. Gabriel moved to the research facility, where he was given an office, and he is thankful that his old Nokia mobile phone still works. The building now serves as the ministry’s control center. Other ministries are in similar shape. The president and his cabinet are working in makeshift offices in a police barracks near the airport. They have little more than mobile phones, which explains why there is so little evidence of any government presence in Haiti, and why United Nations peacekeepers and US soldiers are running the city. Gabriel says that the cabinet doesn’t know — and cannot possibly know — what the future has in store for Haiti. “We need brainstorming, and we need advice.” But one thing, he says, is clear: “We cannot rebuild Port-au-Prince the way it was built before. We will have to resettle a lot of people, and we have to start thinking about other cities.” He wants to develop a new seismographic institute, but that will require prompt assistance from foreign experts. Prépetit cannot possibly accomplish this task alone. Is it even possible to simply abandon a capital? Wouldn’t it be preferable to rebuild, using lighter materials and safer construction methods? President René Préval is familiar with Etheart’s plan. The two men are old acquaintances, but the president is still skeptical. He calls the former professor “Dessalines,” a reference to Jean-Jacques Dessalines, once of Haiti’s liberators. In 1803, he defeated the French colonial masters with an army of escaped slaves, who eventually founded their own country. Dessalines made his capital at Marchand, a small town in the country’s interior. Dessalines, who later proclaimed himself emperor of Haiti, using Napoleon as his role model, was murdered in 1806. Today, his statue stands in front of the ruins of the presidential palace in Port-au-Prince, which his successor turned into the capital. His old capital, a city of about 15,000 people, is now called Dessalines. Etheart believes that a place like Dessalines could now become the country’s new capital. As ludicrous as it sounds, he knows that the idea makes sense. According to Prépetit, the plain surrounding Dessalines is, seismologically speaking, one of the safest areas in the country.